Flats Fishing guides specialize in fishing the shallows of the flats. 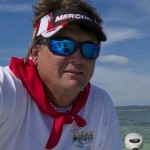 Popular species for flats fishing are Tarpon, Permit and Bonefish. Flats fishing guides generally specialize in both light tackle fishing and salt water fly fishing.